Early menopause can come a surprise to women, as menopause is not normally expected for a good few years. It can also be rather distressing, as the woman becomes aware that her fertile days are coming to an end. The causes of this condition are rather elusive and not well-known by the general populace. Keep reading to find out some of the hidden causes of early menopause. The official definition is menopause that occurs before the age of 40, and although it can sometimes be expected - for example, after a hysterectomy - there are often times when it can come seemingly out of the blue. Most of the time, early menopause can be traced to a particular reason, some of which are described below, but there are some occasions when even doctors are not aware of why it has happened. Without visiting a doctor, it is impossible to know if you are truly undergoing early menopause, but if your period stops or changes before the age of 40, this could be a sign. It could also, however, be caused by a treatable health issue or pregnancy, so it is important to seek medical advice. Menopause symptoms, like hot flashes or vaginal dryness, could also be an indicator, but are not sufficient for diagnosis. The doctor might do a blood test to see if any issues really are caused by early menopause. Keep reading to find out some of the hidden causes of early menopause. 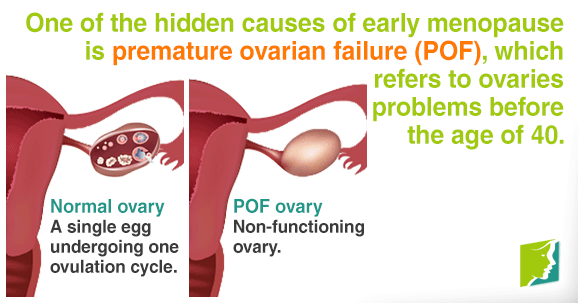 Premature ovarian failure (POF) can be primary or secondary in nature. Primary causes are biological abnormalities, such as chromosome anomalies, enzyme deficiencies that mean enzymes are damaging eggs and preventing estrogen production, and autoimmune diseases, when the body starts producing antibodies that attack its own tissues. Surgical and medical procedures that have resulted in some kind of failure of the reproductive system can induce early menopause. Early menopause is often a risk for those who have undergone some kind of cancer treatment, such as radiotherapy or chemotherapy. Some women opt to store their eggs before treatment. Surgical procedures that triggers menopause include hysterectomies or ovary surgery. In addition, certain infections can trigger early menopause, although this is not common. Infections that carry a risk for early menopause are tuberculosis, malaria, and mumps. The reason for early menopause can sometimes lie in the genes. If there is a family history of early menopause, then it is more likely to happen. The statistics suggest that a woman whose mother had early menopause is six times more likely to have it than other women. Early menopause will not happen to the vast majority of women, so it should not be feared. Surgeries and treatments can increase the risk, but if you have concerns, it is best to talk to your doctor beforehand and work out ways to reduce the risk or even discuss procedures, such as egg storing. However, there are cases where it cannot be predicted, but if you can, look to your mother to work out the probability of you getting early menopause. Read about the common causes of early menopause.